Now that was a very good day. After a mud-fest at the Windsor Duathlon in April and the logistical nightmare of baggage at the Age-Group events at the World Triathlon Leeds in June, it is time to give British Triathlon credit where it is due. I'm pretty certain they would have felt a huge pressure to produce a quality racing and event experience in Liverpool - and they did just that. From seeing five of the Rio-bound paratriathletes competing in their British Champs to start the day, through to a very competitive and large Age-Group field racing for British Standard Distance honours and then on to welcoming hundreds of beginners into the sport through the Sprint and GoTri waves... before the very best of British Youth, Junior and Senior Elite. That was a comprehensive, inclusive and quality day all around. Great work by everyone involved in the planning and delivery, you did a great job. The Elite races saw a thrilling sprint finish for top honours with Jessica Learmonth and Australia's Charlotte McShane shoulder-to-shoulder with less than 100 metres to go, while Adam Bowden lived up to his pre-race favourite status and delivered a quality performance to take the Men's Elite title in style. Not to far behind the best of Britain's extensive Junior talent filled plenty of the top ten positions too. Not raced Tri Liverpool before? Well worth considering for 2017 in my eyes. A record-breaking 1,900 participants, including international elite triathletes and paratriathletes, amateurs and first timers, took to the iconic city centre course to swim, cycle and run at this year’s Tri Liverpool. Spectators lined the streets, with over 4,000 local people on the side lines supporting their family and friends, and giving many of the paratriathletes who will be racing in Brazil an inspiring send off. It was an early rise for the paratriathletes who kicked off the day with their 7am start time, racing the sprint distance triathlon across multiple classifications. Paratriathletes swam 750m, cycled 20km using hand cycles, bikes or tandem bikes with a guide, followed by a 5km wheelchair or running race. This year’s Tri Liverpool was particularly important for the paratriathletes who competed for the last time on home soil before heading off to Brazil to participate in the inaugural paratriathlon at the Rio 2016 Paralympic Games. Paratriathletes included Lauren Steadman who took part in the Paralympics as a swimmer in 2008 and 2012 and 2004 Paralympian David Hill. Amateur triathletes were next to complete the longer standard course comprising of 1500m swim, 40km cycle past some of Liverpool's most iconic waterfront landmarks and complete a final 10km run to the finish. The standard distance event had extra prestige as Home Nation members had the chance to compete for British Age-Group titles. Triathletes aiming for qualification to the Great Britain Age-Group Team also had the opportunity to book their place at the 2017 ETU Standard Distance Triathlon European Championships. A few famous faces on the course included Hollyoaks actor Jared Garfield who plays Nathan Nightingale, his fellow cast mate Karl Collins (Louis Loveday), and former Big Brother winner and DIY expert Craig Philips. "It was much better than last year because of the weather. The swim was lovely. Didn’t see any of the jelly fish which I was kind of disappointed with to be honest with you because I like jelly fish! The bike was amazing! I really enjoyed that – playing cat and mouse with three different people all along the route which is always fun. And the run for me is always hard and it was today. I finished and I am amazed that I have and really pleased that I have. "I mean even last year there were big crowds in the pouring freezing rain and cold. But this year fantastic crowds and I am so lucky because I sort of get cheered on from one bit of crowd to another. They are shouting my name and I am just really lucky so it is fantastic. Really fabulous and encouraging too. What is also good is there are all the people who are trying triathlon for the first time, running round them. And there is some real camaraderie out there on the course as well." 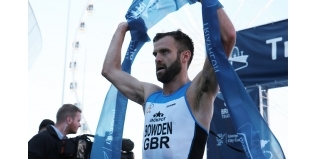 Great Britain and international triathlon elites included last year’s winner Morgan Davies, twin brothers Tom and David Bishop, and Adam Bowden who has taken part in six of the seven ITU World Triathlon Series races this year. The elite men’s race saw Adam Bowden come in first in a time of 54.58, with Ben Djikstra second (55.18), and Thomas Bishop (55.23) took third place. In the women’s field, Sophie Coldwell made a return to the city to defend her title won in 2015. There was stiff competition with a strong international field including another former winner, Charlotte McShane from Australia. In the end, Charlotte McShane took first place with a time of 1.01.41, Jessica Learmonth (1.01.44) second and Heather Sellars (1.02.02) third. "I’m really over the moon and to race the British race was what I wanted to do the whole year really and it’s nice to be on British soil and get a British title at the same time." First time triathletes took part in the GO TRI+ Beginner distance, swimming 400m, cycling 10km and running 2.5km. GO TRI training sessions are available in four of Liverpool City Council’s Lifestyles centres, and have supported many of the first time triathletes to become more confident in each of the elements. If you are inspired by Tri Liverpool, you can take the first step to getting into triathlon today by creating a triathlon that fits your life. Just visit www.gotri.org/yourgotri and select which swim, bike or run you would like to do – these could include “cycle to work”, jog around the block” or “walk to the shops”. Tri it your way! If you would like to catch up on all of the Tri Liverpool’s best moments, highlights will be broadcast on Channel 4 on August 27, 2016. Tri Liverpool is delivered by British Triathlon in partnership with Liverpool City Council. For more information, results and official race pictures of Tri Liverpool 2016, visit www.TriLiverpool.com.